With today’s queen stage of the Giro including 4500 metres of climbing, even the pros are looking for ways to ease the pain. Today’s Giro d’Italia queen stage from Pinzolo to Aprica starts with two category two climbs: Campo Carlo Magno at 1681m then the Passo del Tonale at 1883m. The climb up to Aprica at 1173m comes as a breather before 1300m climb to the monster Passo del Mortirolo at 1854m with some sections at 18%. And to finish things off, there’s the final climb back to Aprica, for a total ascent of 4500m in 177km. You can tell a serious day’s climbing is scheduled when the pros start to ask for lower gears to get them over the hills. 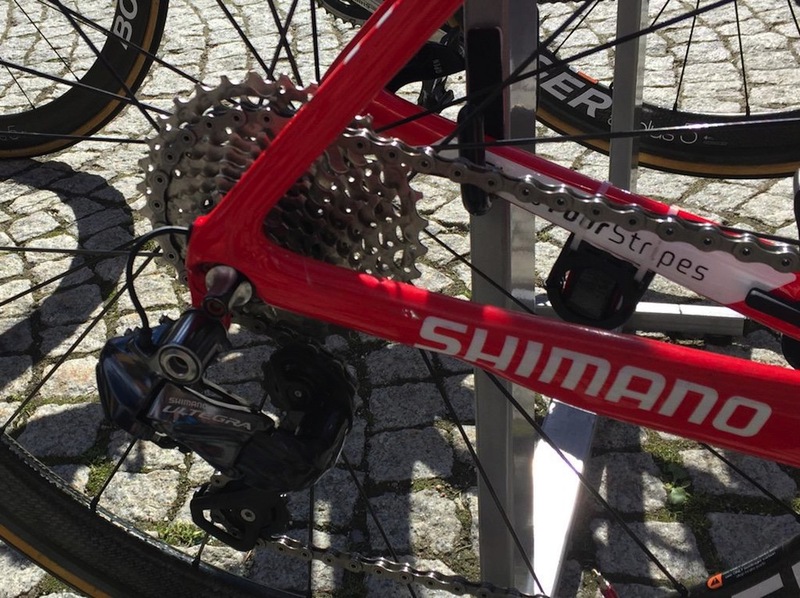 Shimano tweeted this photo of one of the Trek Factory Racing bikes set up with an Ultegra rear mech with an 11-32 cassette. With Dura-Ace only going up to 28 teeth maximum at the rear, the switch to Ultegra obviously offers that bit more wiggle room. Meanwhile Brent Bookwalter of BMC went even further, with a 53/36 chainset coupled to an 11-36 cassette, giving him a 1:1 lowest gear ratio. 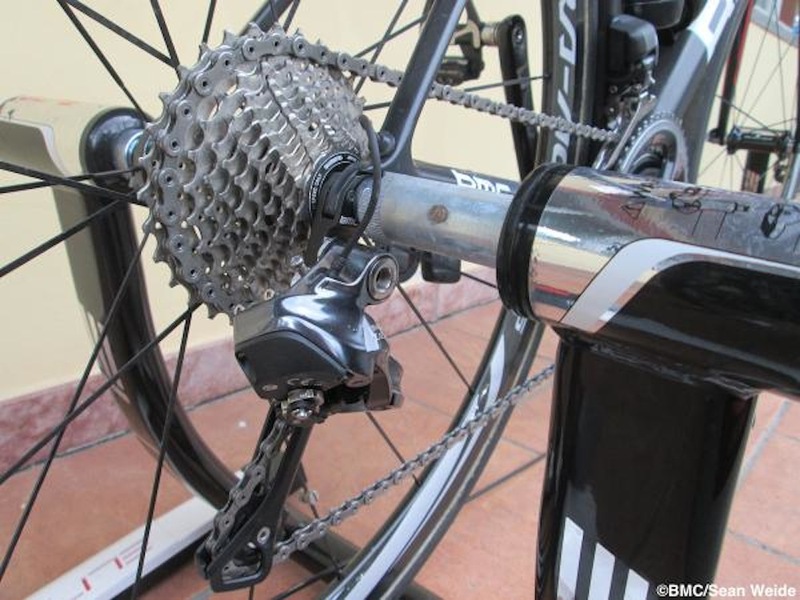 To make this set-up work, BMC have installed an MTB-style long derailleur cage on the Di2 rear mech. 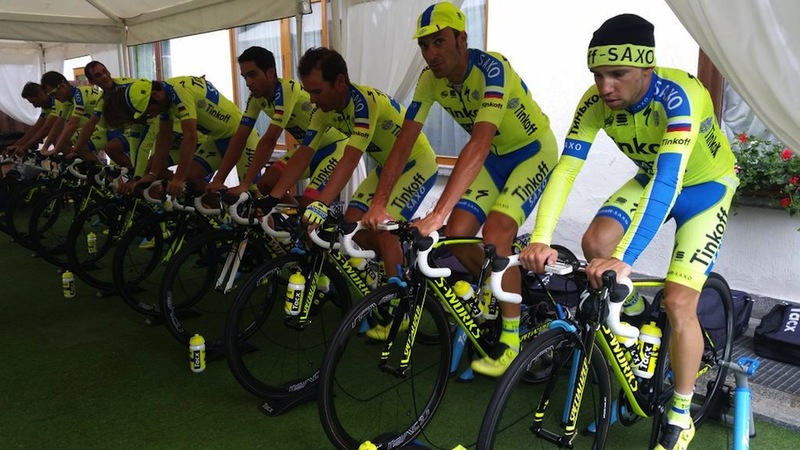 Tinkoff-Saxo warming up pre-stage 16. Ivan Basso looks as if he’s looking forward to the stage. 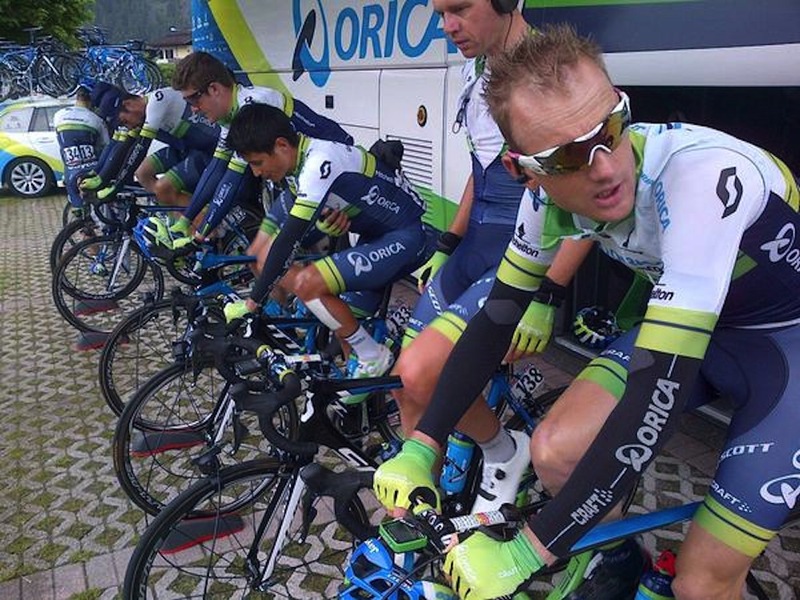 And Orica-Greenedge were under the awning of their team bus.